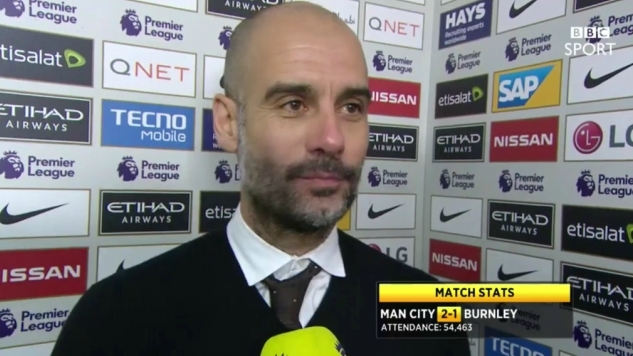 By most accounts, Pep Guardiola had a good day yesterday. Manchester City overcame Burnley 2-1 at home, despite going down to 10 men early in the game and a referee keen on making some interesting artistic choices. Still, it was the result that mattered, and the win lifted City back into the Top 4. But for all the good news of the day, Pep seemed oddly wistful. And in an interview with the BBC that could be charitably described as “awkward,” the former Barcelona and Bayern Munich manager dropped an explosive nugget. So, yeah. He could’ve just been in a foul mood. Between the tough loss to Liverpool just two days prior and Fernandinho getting sent off again, it wouldn’t be unreasonable to expect some aggravation. If this was a case of Pep being grumpy or having a lot on his mind, he’ll probably walk it back sometime this week or next. But I wouldn’t be so sure that’s what’s going on. We could very well be witnessing the final chapter of Pep Guardiola’s management career.